For years, Inside Golf has encouraged clubs across Australia to expand their reciprocal arrangements in order to create a more attractive prospect to today’s potential members. 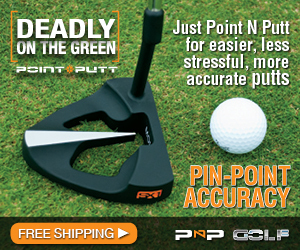 It is a well-known fact that golfers like to play a variety of courses when travelling, and challenge their game on a new course with a new set of hazards and obstacles. It seems that some of you are cottoning on, as last month Western Australia’s The Vines Resort and Country Club announced a history-making reciprocal agreement with Goldfields Golf Club at Kalgoorlie, in a deal that took over nine months to bed down. 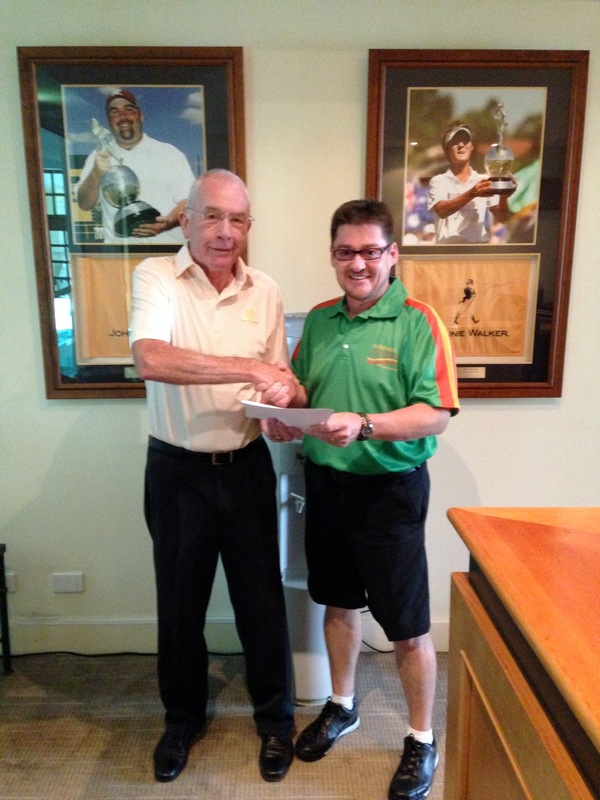 Graeme Wilmot, the Finance Director from the Goldfields Golf Club and John Messenger, the Golf Club Manager at The Vines, successfully negotiated the perpetual deal which is hoped to benefit members of both clubs well into the future. The agreement appears to be and ideal fit, as both Kalgoorlie and The Vines feature world-class Graham Marsh-designed layouts, and offer top-quality experiences. Goldfields members visiting The Novotel Vines Resort will benefit from discounts off the magnificent accommodation, food and beverages, while The Vines members travelling to Kalgoorlie will have the opportunity to not only visit the historic mining town east of Perth, but also bring their clubs along to spend an extra few days playing the much acclaimed course in Kalgoorlie. “I am delighted that these two courses have come to an agreement that is of such great benefit for their Membership of both these prestigious Clubs,” Marsh said. To enquire about reciprocal rights or to join the Vines Golf Club, call the Golf Club Memberships team on (08) 9297 3000 or email membership@vines.com.au. Attracting golf membership today is challenging with so many different activities filling our day. McLeod Country Golf Club have heard the call for “more value for money for the time poor” and have recognised that a traditional membership is not what is needed by many today. You just have to look to the squash industry to see the folly of not keeping the young involved in your industry. Most clubs today have an average membership age of over 65 years, a level that is not sustainable into the future. To redress this issue clubs must attract younger members. McLeod Country Golf Club is again making history by adding two new membership categories at its recent AGM. “Young working professionals today demand value for money,” says Club President Deborah Prior. “The new Young Professional Membership for those 26 to 45 years of age allows those who want to play competitive golf to do so with a generous 20 competition game limit per year and unlimited social play on any day, it’s a great deal. CHEQUE IT OUT: Carbrook Golf Club Peter Anemaat (left) and general manager Scott Wagstaff (right) with Prostate Cancer Foundation of Australia’s Graeme Higgs (second left) and major sponsor Geoff Rees (ALCO Batteries). THROUGH its Pink Bag Club, Carbrook Golf Club in Brisbane’s east recently raised $5100 for the Prostate Cancer Foundation of Australia and took its total over the past four years to $21,000. “The club within a club, which is managed by the golf club’s president Peter Anemaat, has grown so much over the past few years that the leaderboard that has each member’s name listed has had to be redone three times in three years to cater for the increases,” said general manager Scott Wagstaff. Wagstaff, Golf Management Australia (Qld) manager of the year, said the Pink Bag Club raised funds from weekly events and culminated with an annual golf day. “The weekly events see the member with the lowest score for the day crowned the Pink Bag winner, which forces them to pay a fine and use a pink golf bag for their next round,” he said. “They must also carry a pink purse while at the club otherwise they face further penalties. The club’s slogan, “give your prostate the finger”, not only raises important funds for the foundation but also brings awareness to its members about the reality of the disease. 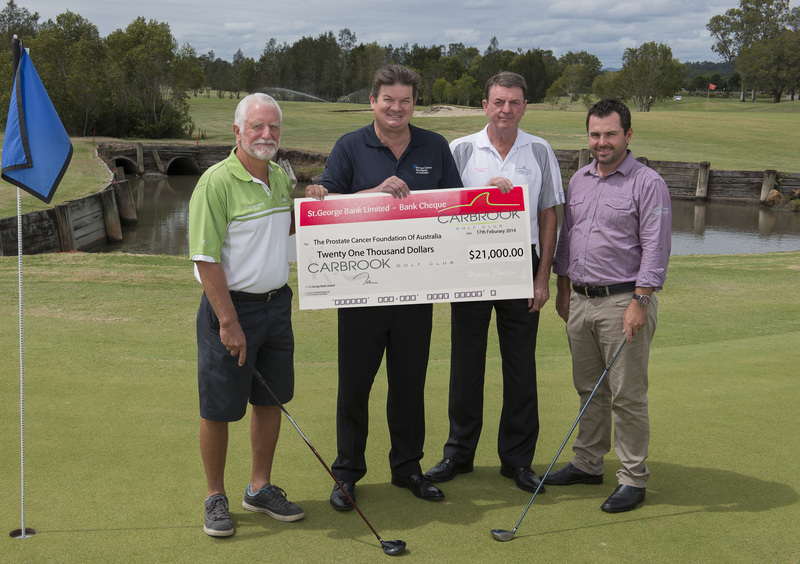 Carbrook Golf Club will continue fundraising and has hopes to raise a record amount this year. 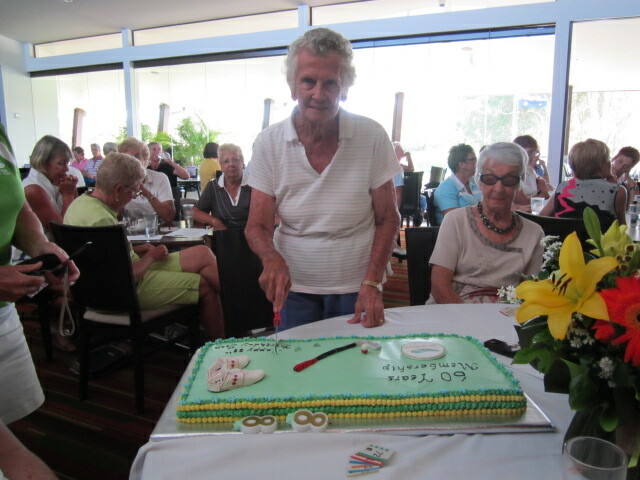 Burleigh Golf Club’s life member Joan Rackley celebrates her 88th birthday at the club where she has been a member for 60 years. FOR the past 60 years, Joan Rackley has been pounding the fairways at Burleigh Golf Club on the Gold Coast. Joan, who is 88 years young, joined the club on March 12, 1954. She is the longest serving member of the club, which honoured her with life membership. Joan and her late husband Graham, along with a small group of dedicated golfers, were instrumental in building the golf club. She was a member of the first ladies committee formed in June 1955 and three months later the club played its first competition. Since that day in September 1955, Joan has been an active player and member. She served as the club’s ladies captain from 1967-’69 and as president from 1970-’72. As a player, Joan captured the club’s C grade championship numerous times. She continues to play golf twice a week off a 34 handicap. “This is a remarkable achievement for Joan who just turned 88,” a club spokesperson said. “She plans to continue playing her beloved game as long as she is able. “Joan celebrated the milestone (life membership) with fellow life members Val Geyer, Judy Tanner and Pat Bartlett and the rest of the lady members at a special presentation in March. BROOKWATER Golf and Country Club is holding two important charity golf days in May and June. The Multiple Sclerosis (MS) Charity Golf Day is on Friday, May 30 and the Mater Cancer Research Golf Day in aid of breast/prostate research is on Friday, June 27. Both are four-person ambrose events teeing off a 8am (shotgun start). The cost to play is $130 per person and $75 for Brookwater members. Each important golf day includes range balls, golf in a shared electric cart, BBQ buffet lunch and great prizes.